Introducing BRUS with Kongl. Teknologkören. We interpret the sounds of nature: the whistle of the wind, the roar of the river and the changing seasons through music by A.F. 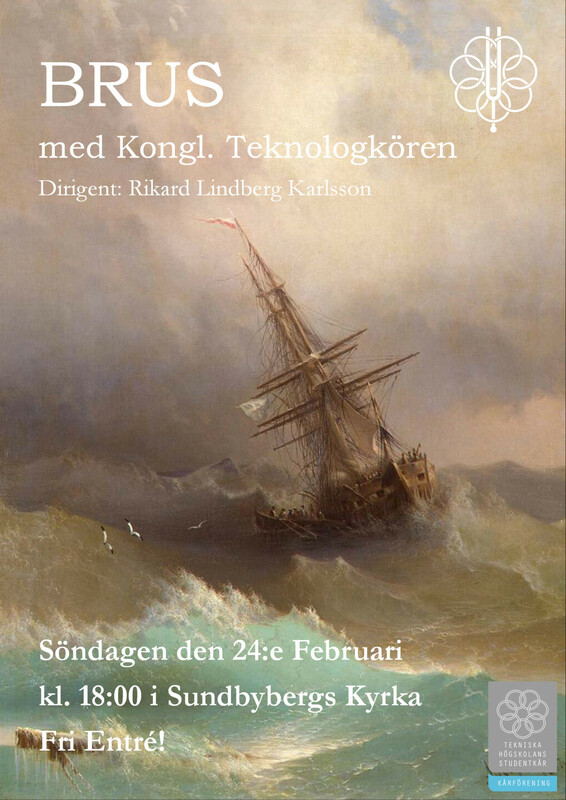 Lindblad and Sven-Eric Johanson to texts by Erik Axel Karlfeldt, among others. Please read through "Sing with us" for more information about the auditions and what is expected of our chorists. The auditions are set to the 19th of January. 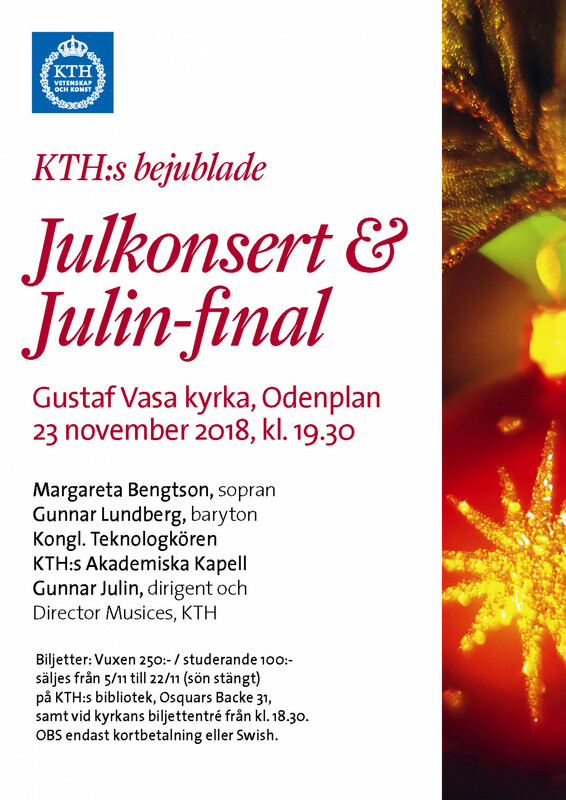 Welcome to KTH's traditional Christmas concert in Gustaf Vasa church at Odenplan! There will be a great mix of well known and less known music from different genres. 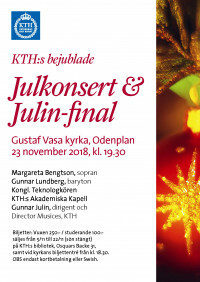 This evening will be special as Director Musices Gunnar Julin conducts his last public consert with KTH:s Akademiska Kapell before his retirement. Anything can happen! 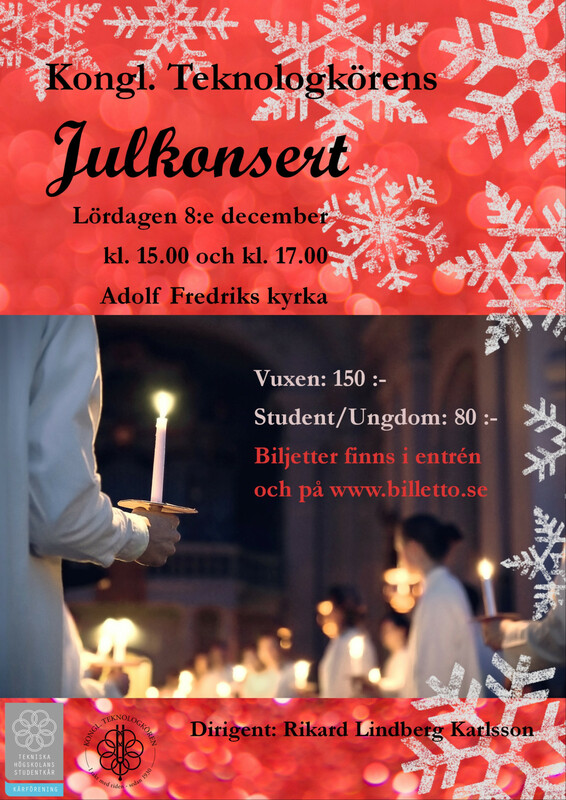 Tickets can be purchased between 5th and 22nd of November at the KTH Library (Osquars backe 31) or at the church entrance on the day of the concert from 18:30 (if any left). 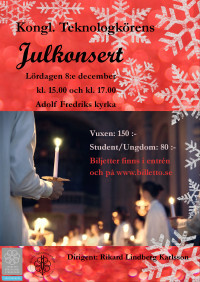 Price: adults 250 SEK / students 100 SEK. Credit card or Swish only. When the darkness of December has entered, Kongl. Teknologkören invites you to Christmas concert in Adolf Fredriks church. Experience traditional christmas music and Lucia procession Saturday the 8th of December. There will be two concerts, one at 15:00 and one at 17:00. Tickets may be purchased at the entrence or at billetto.se.